Smurfs: The Lost Village is an animated tale of female empowerment co-written by Stacey Harman and Pamela Ribon. That's the same Pamela Ribon whose previous screenplay was the similarly-themed Moana. Here, she has ostensibly imbued the headstrong heroine of this production with some of the same attributes as the intrepid Moana. 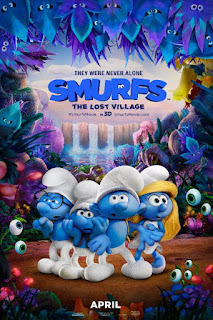 The Lost Village revolves around Smurfette (Demi Lovato), heretofore the only female Smurf. In fact, she's not actually a Smurf, but a facsimile fabricated from a lump of clay by the evil wizard Gargamel (Rainn Wilson). As the film unfolds, we find her frolicking around the very peaceable Smurfdom with her best friends Brainy (Danny Pudi), Hefty (Joe Manganiello) and Clumsy (Jack McBrayer). Narrator/patriarch Papa Smurf (Mandy Patinkin) is quick to point out that all the other smurfs' names tells you their dominant trait, ala Grouchy (Jake Johnson), Jokey (Gabriel Iglesias) and Nosey (Kelly Asbury), while Smurfette's alone fails to reveal a hint about her. Next thing you know, the fearless foursome is in a a race with Gargamel to discover the place. He's hatched a diabolical plot to kidnap all the Smurfs. The plan is to become the most powerful wizard in the world by ingesting their essence after boiling them in his lab. Not to worry. There's a two-fisted shero prepared to prove, in convincing fashion, that a girl can grow up to be anything she wants to be. A priceless primer for impressionable tykes!